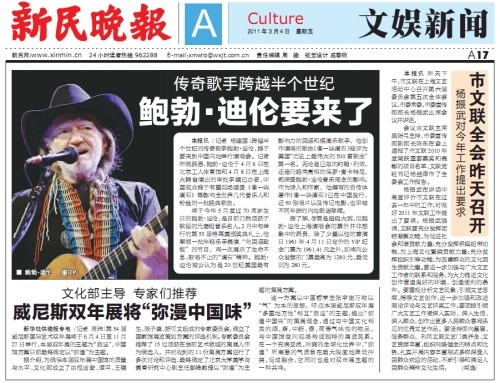 “Bob Dylan’s coming,” announced the March 4 edition of the Xinmin Evening News. He’ll perform in Beijing on April 6 and in Shanghai on April 8. Click for many, many more. Last Friday afternoon I took part in a “Black Box: Literature on Spot” event at the Get it Louder festival, which wrapped up its Beijing leg over the weekend. You can click through for a detailed description of the program and its participants, but in brief, “Black Box” was literary creation as performance art. A writer, sequestered in a curtained cubicle, composed in isolation. Beyond the wall, a translator attempted to keep pace as the text scrolled up the monitor. Spectators viewed the entire process on screens outside. I was translating for Pan Haitian (潘海天), a writer of science fiction and fantasy and the editor of Odyssey of China Fantasy magazine (九州幻想). (You can find a brief introduction to some of Pan’s work in this post.) I’ve translated a bit of Pan’s work in the past, including a version of “The Eternal City” (永恒之城) in English for submission to ALIA6, an Italian-language anthology of SF in translation. Pan warned me beforehand that his typical approach to composition involved leaving lots of sentence fragments and place-holders, which he’d expand once he had a rough framework of the story sketched out. Thankfully, this did not become apparent until about half an hour into the event, at which point my nerves had settled. Ordinarily, I’d probably have gotten sidetracked early on by the quotation from Diary of a Madman and would have spent the full two hours reading up on the historical figures mentioned in the text. Or, if I were particularly disciplined that day, I’d have substituted dummy text for the quotation and moved on to the next paragraph, leaving the decision of how to translate Lu Xun for a later revision. Neither option was available to me, the first because I brought no reference materials and could not access the Internet, and the second because I needed to put up some sort of translation, however imprecise, for the audience. I had to make decisions, even if they weren’t ideal. Don’t recognize a locust tree? Then “tree” it is. Forget the alternate term for tuberculosis? Let’s call it a “fatal illness.” Although I often take this approach in a first draft when I want to capture an uninterrupted voice, I usually tag provisional translations so I can refine them later. Leaving them unmarked disguises my translation as a finished product instead of a work in progress, or more accurately, a partial transcript of a one-time performance. It’s not a complete transcript because it doesn’t show where edits were made during composition and translation, and it retains just a few traces of Pan’s fragments and place-holders. His writing process seemed to mirror the pace of the story. The opening, which sets the scene and gives a bit of back-story, appears in the final product pretty much identical to how it was initially typed in. The sole edit I can remember was a change from “the man in the gown” to “the mustached man” (which I unfortunately rendered as “the bearded man.”) During the action scenes, things got more hurried and fragmented. For example, at a point in the story when Lu Xun has plummeted from a rooftop to grapple with an intruder (later revealed to be Liang Shiqiu), Pan inserted a bracketed note that I translated as “[insert blow-by-blow].” And the title only became Lu Xun: Demon Hunter after Lu Xun was mentioned by name in the text (to gasps and laughter from audience members who hadn’t caught on yet). Pan’s original (恶魔猎手鲁迅), an application of wuxia tropes to Lu Xun’s account of why he chose to apply himself to writing, is entertaining, although it terminates abruptly — Pan said afterward that he needed additional resources before he could move forward. As a translator, I enjoyed the game of keeping up with the small changes and additions that the author was continually making to the text; as a reader, my mind had already filled in the details, and I just wanted him to continue with the story. 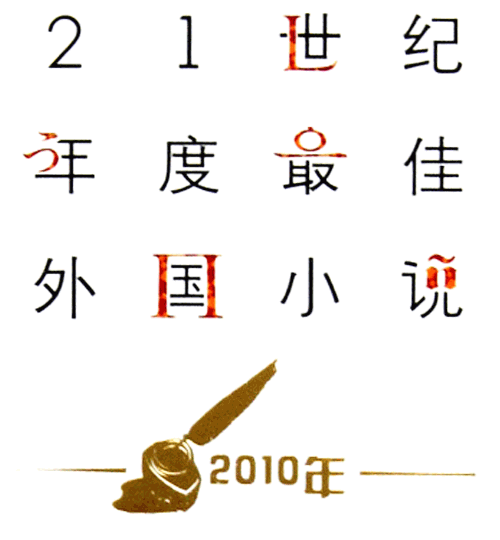 In a post at Twelve Hours Later, I discuss the political fantasy Age of Prosperity (盛世, aka The Fat Years, aka The Gilded Age) by John Chan Koon-Chung (陈冠中) in the context of other recent socially critical Chinese science fiction. One curious aspect of this novel is the shift in point-of-view. Part I is largely told by Chen in the first person, aside from one chapter in which the characters who remember the missing month narrate their personal histories. Part II switches to limited third-person narration. Because Chen identifies himself as a genre writer (an author of third-rate detective fiction) in the first half, one likely explanation for the point-of-view switch is that he’s composing a mystery based on the old friends he’s encountered. With that in mind, both the character histories and the third-person narrative are the creation of first-person Chen from Part I. 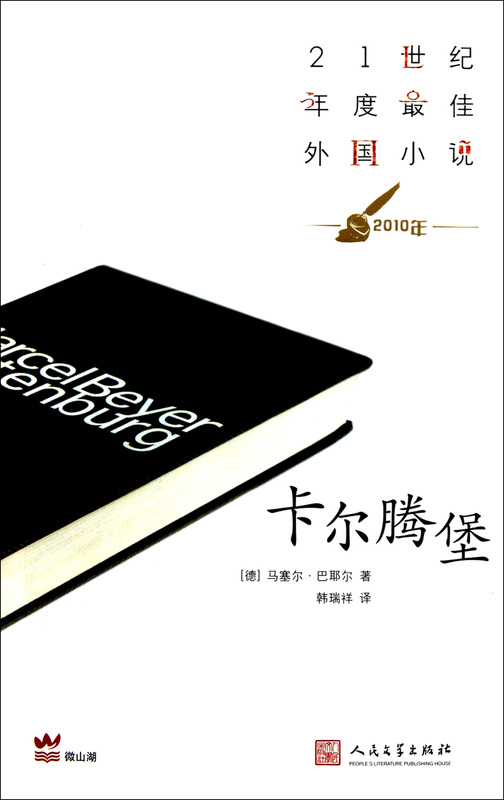 There are indications that this may be the case: Chen’s musings in Part I that he really ought to take up writing again, the interrogation of the government official in Part II, when Chen remarks that he feels like a character in a novel. This hypothesis suggests that an English translator ought to style the dialogue with a little bit of hard-boiled coloring, along the lines of the weary narration at the opening of Chandler’s The Long Goodbye. Chen the dilettante detective stalks through Beijing’s well-to-do neighborhoods in search of a missing month, gleaning bits of information from old friends who have conveniently managed to track him down and from well-placed members of the establishment who may be using him for their own purposes. 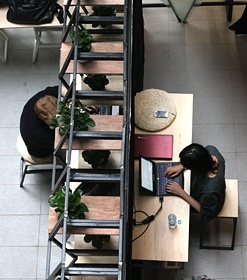 The risk with this approach is that you’d be imposing a voice on the original text that might not be there — the Chinese is colloquial and conversational, but not particularly stylized — but occasional quips in the dialogue and self-deprecation in the interior monologue hint that it might be justified, if just barely.